Too Soon to Head North? This week I was once again reminded of the reality that I am but just a bit character in this play called life. It all started with a 2 hour drive to the Phoenix airport where I dropped Barb off for her mid-winter vacation. She had enough of fun in the sun and flew to Minnesota for the week. Well at least I had the dogs to keep me company for the week. When I returned home and opened the door, they jumped down the stairs, ran past me to the truck and stared at it jumping up and down waiting for Barb to get out. When it became apparent that she was not in there, they started looking off at each of the neighbors to see which one I had maybe dropped her off at. Then, realizing she was not here at all, they did their business and slowly walked back to the rig and up the stairs without even giving me a second look. It was apparent, painfully apparent, that I was just a bit player in this pack and every other time we came home in the past excited to see us it was not us they were excited to see it was Barb, the true leader of our pack they are always excited to see. The rest of the week dragged by as we waited for Friday and Barb’s return. Since we would be leaving on Sunday, I slowly started putting away tables, chairs, lights and accessories we had scattered around our camp. I also worked on a list of chores I was hoping to get done while she was gone. The first was the brakes on the truck. I had bought a new set of brakes over a year ago thinking that with over 100,000 miles on the truck they were due to be replaced. Last winter I pulled the wheels and calipers off only to find more than ½ of the original pads still intact so I did not replace them. I pulled everything off again last fall at the farm only to find the same. Now with almost 130,000 miles on them they would certainly need to be replaced right? It seemed in our working lives we were replacing brakes every 50,000 – 70,000 miles. But when I pulled them off this time they were still about ½ worn. Amazing! I guess in our working lives, driving always in a rush from stop light to stop light we really used them a lot. Now with all these highway miles and the assistance of the engine brake as well as the disc brakes on the trailer, they do not get used nearly as much. So I put the pads away to be used another day. The next chore was to fix the caulking around the window we replaced last year in Tucson. When we replaced it I had used the white window caulk/tape that was provided and it oozes out of the frame as you tighten the window. I had wiped the excess off but you could see a white ring around the window seam. Didn’t bother me but by now you know I am not the boss around here and it bothered the boss so I set about trying to clean it up so no white was showing. Try as I may I could not get rid of the last of the white around the edges. Upon inspecting the other windows I noticed that they were painted after the window was installed so all the caulk was painted over. So I set about putting blue tape around the window so only the tiniest of surface was showing and sprayed it with black paint. Problem solved. Dale cutting up the BBQ! Red and Pam also invited me over one night for an awesome pork chop dinner. Barb was gone 4 nights and I got invitations to dinner for 3 of those, that is what I call good friends! 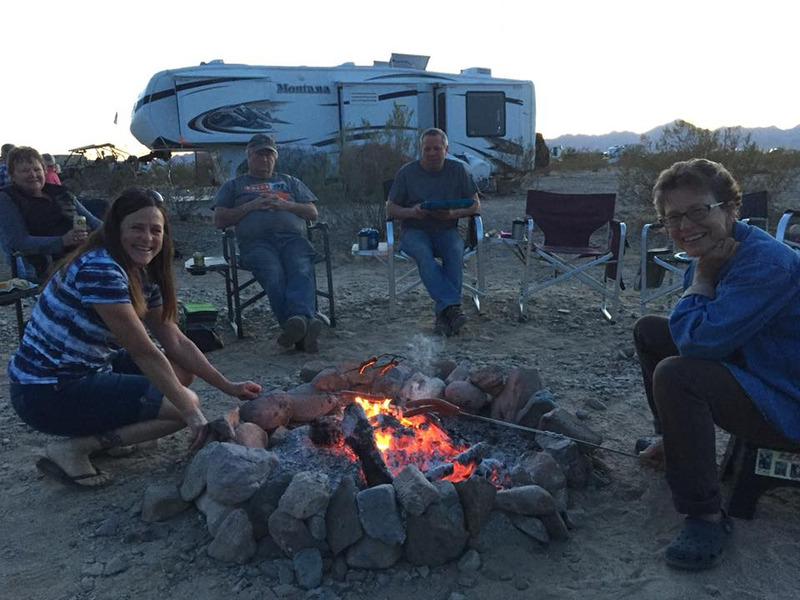 Four of us are set to leave tomorrow morning (Steve/Dianne, Vicki/Harry, Red/Pam and us) so the night before we left we had one more get together with our little desert community. Jim/Brenda, who returned after leaving us for more than a week and Dale/Ruth who arrived on the 19th also joined the celebration in addition to Dale/Chloe and Les/Sue. One last hurray and toast to good times and good friends. Now with the embers of the fire dying and the laughter only an echo, we are set to leave this desert oasis. We have mixed emotions, they are all such good friends and you hate to leave but exciting adventures await us down the road. Who knows when we will all be together again. We, for one, have east coast plans for next winter. I know we will see Jim and Brenda in South Dakota. Vicki and Harry will be in South Dakota as well this summer, only an hour away working at Prairie Berry Winery in Hill City. We hope to catch up with Red and Pam in Arkansas or Texas sometime and it looks like Dale and Ruth will be in South Dakota in April to renew their drivers licenses. Our travel path might cross with Steve and Dianne sometime this year as they make their way east through Canada but neither of us know where we will be when as of quite yet. As for Les/Sue and Dale/Chloe it is not looking good but one thing about this lifestyle is you just never know what the future brings! Today we return this spot back to the desert leaving only tire tracks and some rocks painted by grandkids Kendall and Dylan as evidence of our presence. Our truck pointed north towards Oregon, we hope to be in 4 days where more adventures await, but maybe a little too soon? Why do you Fulltime RV? As we approach the anniversary of our 4th year on the road I could not help but reflect on our journey so far and if other's were similar or vastly different. There are a number of reasons why people hit the road and live fulltime in their RV’s. The sense of adventure, financial, to be closer to children, grandchildren and other loved ones….the list could go on and on. For us, the answer to that question is all of the above. We have always been ones to live on the more adventurous side of life…. hunting, fishing, horseback riding, ATV’ing, really anything that will allow us to be outside. There is no doubt that living in your RV can be cheaper than living in permanent structure. 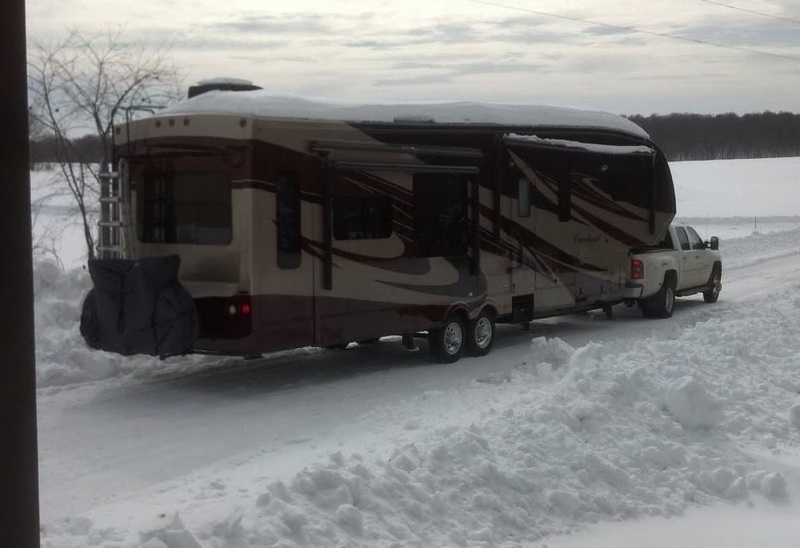 We have not always found this to be the case but for the most part for us, it is cheaper than living in a sticks and bricks and our ability of visiting our kids, grandkids and other loved ones is certainly a huge benefit of being on the road fulltime. These are all great reasons to hit the road but for us, none were our main reason. If we were to be honest with ourselves Barb and I would both agree we went on the road to escape. Like many, we more or less lived for our jobs, lived to pay our mortgage and basically get by week to week, month to month. We both had careers that we liked, but personally for me, I did not like who I was doing what it took to be good at it. Priorities were wrong, thinking was selfish and I took way too many things in life for granted. Hitting the road was a chance to start over again and it is probably the best thing we could have done for ourselves personally and as a couple. Today, almost 4 years later we have absolutely no regrets, we are happier than we have been for years, have seen some incredible places and met some great people. We would do it over again in a heartbeat. What started out as seeing as much as we could as fast as we could has evolved over the past couple of years. One of the best things was seeing something different every week and the ability to move on a whim....If you didn't like your view, pack up and move! If your neighbor has a noisy generator, pack up and move! The reverse was the same, if you loved the area you were in, stay a few days longer. Then without even really realizing it we found ourselves planning return trips to the places that we enjoyed the most rather than looking for new places and experiences. It is a Catch 22 really as we have had some incredible experiences and developed great relationships with people that we want to do it every year. More than once I have told Barb that if it wasn’t for this thing called winter I don’t think we would ever leave North Dakota and Ontario. So now our travels have evolved to visiting these two locations and exploring other places until winter passes and we can get back north. With the purchase of our property in South Dakota we have another place that we love and cannot wait to return to. I am not sure if this is good or bad, typical or something unusual but it is where we are at right now. So what will the next 4 years bring? I am sure that we will find ourselves spending more and more time in South Dakota as we build our house and explore more of that area but we still plan on getting up to North Dakota, Ontario, visiting our kids as well. That’s the great thing about this lifestyle, you are pretty much in control of your own destiny. If we were able to mirror the highlight adventures of the past year again and again we would be very happy. We would like to do those while adding a few new ones to our list and we will probably try to do just that. The day after the kids left we headed up to Bouse to watch the Parker 425 with friends Tracy and DeLano. We had never been to Bouse let alone the race. From Quartzsite we drove east on Plamosa Road for about 20 miles into Bouse then another 6 or so miles to our viewing area. Tracy and DeLano had brought their rig out to one of the spectator areas several days before the race to save a good viewing spot about 100 feet off the course. The course itself is over 140 miles long and the racers make several laps over 6 or more hours. The wind cooperated so the dust was being blown away from us which offered a great view of the racers as they went by. Just as cool as the racers were the helicopters following them and filming the event. They would fly by less than 100’ over the racers and wave as they went by. Harry and I were also able to get out to play a round of disc golf and attend the Fun Fly Day at the local RC Airport. Did you know they have multiple discs for disc golf? Vicki and Harry's son is on the disc golf tour and uses 12-20 different discs in a round. We each used three; a driver, a midrange disc and a putter for the closer shots. Unfortunately, those were the highlights of the past 2 weeks as we put ourselves on a self-imposed quarantine. We started not feeling well Superbowl weekend with sore throats and congestion. I was able to fend off this round but Barb was down for the week. Soon after she started feeling better, I got worse. Looking back I can definitely say that my bout was much worse than hers as she was still able to make dinner and other things around the rig while mine was so bad I could barely get out off the couch and needed to be waited on hand and foot. I slept in the living room all week so she could try and get some sleep but when you are sick like that the rig seems to shrink…..
We spent both our anniversary (32nd) and Valentines Day not feeling well so we took rain checks on those and will celebrate them later. When Barb started feeling better, she would sneak over to happy hour in the afternoons. I would sit it the rig and watch everyone over there laughing and having fun, every once in a while they would wave over towards the rig and laugh some more. That tells you how compassionate they are! How dare they have fun without me! I finally got out of the rig last night as Vicki and Harry made Tri-Tips for everyone so I snuck over to join the group only to find my chair well outside "germ range" of everyone! Ya, that is my chair away from everyone else! Little Creatures in the Desert! 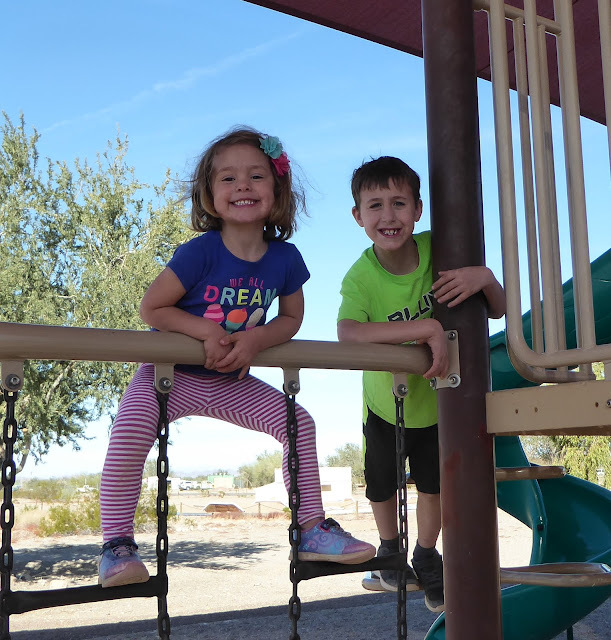 The start of week 2 in Quartzsite brought several changes to our desert community. Faye and Dave headed west to Phoenix, Steve and Deb headed east to Lost Dutchman and our daughter Jessica arrived from Pennsylvania with two of our grandchildren adding two more little creatures to the desert! It has been a long time since I have seen Jessica, Dylan and Kendall. Jessica looked like the same great daughter I had last seen in Salt Lake City a year and a half ago before they left for Pennsylvania. Dylan and Kendall however have grown a lot in that time. Kendall was barely walking and talking last time I saw her and now she is running around like crazy and talks none stop! She is such a cutie! Dylan has grown about a foot (well it seems like it) and like most boys his age, is into video games and army men. The day they arrived they did not get here until almost 3:00 and had been up almost 12 hours so we spent the afternoon just chilling and letting the kids run off whatever energy they had left. About 6:00 we headed over to Steve and Dianne’s for a farewell happy hour for Steve and Deb but the long day got the best of the three young ones so they headed back to the rig for some well-deserved rest while Barb and I stayed and toasted to Steve and Deb’s future travels. Several bottles made an appearance and toasts were made, Barb, still feeling the effects from several nights ago passed on all alcohol. You know what happens when you fly an 8 year old from the east coast out to Arizona? They are wide awake at 4:00am! Jessica and the kids took the bedroom while Barb and I slept in the living room. About 4:00 I heard movement in the bedroom and pretty soon the door opened and we heard the pitter-patter of little feet across the room. Although I could not see him I could feel his presence hovering over me. I knew Barb had to be up too but we both just laid there quiet as little church mice. Maybe, just maybe if we were really still he would go back to sleep. Soon I felt hands on me as he tried to figure out exactly where we were. Once he found our heads he shouted “Grammie where’s your iPad?” Well, he probably didn’t shout it but at 4:00 in the morning it certainly sounded like a shout! We had many busy days filled with activities, lots of walks in the desert, rock painting, visiting the Big Tent, the High Jolly Monument and a few happy hours around the fire roasting hot dogs and marshmellows….. It was so great to spent time with Jessica and just talk. Makes us very proud to see her doing so well not only as a mother but in her career as well. Back in Pennsylvania she has a job as a Nurse Manager for the Neonatal Intensive Care Unit, a very stressful job I am sure. Another day Dylan and I headed out to the RC airfield to watch some of the guys fly their planes. Dylan immediately wanted us to go buy one so we could fly it. I am sure I would last less than a minute before crashing it into the ground. In fact we did see one guy crash his which Red said had to be worth a couple thousand dollars. Speaking of Red, one afternoon he came over about 3pm and asked me if I could come over and help him with something. We got around the back of his rig and he turns around with a smile and said “Want a beer?” Heck ya! Evidently Steve, Harry and Red were having a beer and they figured I needed one and Red wandered over to get me. One of the highlights of the week for me was the hike we did up to Palm Canyon. This is our favorite hike in the area and we try to do it at least once a year. I was skeptical at the onset at exactly how far we would make it with the two little ones in tow. The first ½ mile to the “Palm Sign” is described as moderately easy and we made it to that point without any problem so we carried on to see if we could make it to the palms. The last ½ mile is described as “a very rugged climb” and we had to lift and carry Kendall in several spots. Dylan, on the other hand, is part mountain goat and just climbed up many of the rougher spots. The entire way up Kendall kept saying two words; "So High! ", over and over again as we were climbing she would look around and say "So High!" After about 40 minutes we made it to the top! We sat down, had a snack and enjoyed the view before heading down. The climb down was a lot more precarious so I ended up carrying Kendall on my shoulders the entire way. Even though she is ~ 30 pounds I was glad to get her off my shoulders when we got back to the truck! It ends up there is a lot to do with kids in the desert. Quartzsite has a great little playground that we spent two afternoons at and Red and Pam were nice enough to borrow us their side by side for an hour. They really enjoyed geocaching (a.k.a. finding treasures). Barb set the filter on her GPS to find only larger caches that might have toys in them. When they found a cache they could pick a toy and when they found the next one they had to decide if they wanted to keep the toy they already had or trade and leave a toy. For those of you who have geocached in this area before, you know that many of them are on jeep or 4 wheeler trails out in the desert. Fine if you have one of those vehicles, but Barb said she got some strange looks driving our dually out there! The second to the last day of her visit Jessica joined us for our 2nd annual beer tasting with Steve and Dianne. Harry, Vicki, Red and Pam joined us as well and tasted a few along the way as well. One thing we learned is that we have very varying tastes. Barb, Steve and Harry seemed to match up pretty well on the darker beers while Red and I seemed to like the lighter flavored beers. Jessica seemed to like all the beers! Parts of the week went really fast, other parts, not so much. Kids fight, kids fuss, and have sooooo much energy and require so much energy in return. As I watched Jessica, I had to wonder how she does it. Then I remember that we did it too but were much younger than we are now. She is a great mother with a lot on her plate and made both Barb and I very proud.